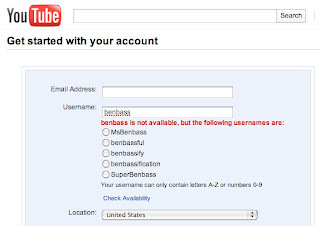 I've never had a YouTube account. My inclination to shoot video is so negligible that, for example, the game-changing Flip camera was released, became insanely popular, gradually cooled off, and was eventually discontinued — all before I ever thought about getting one. MsBenbass: Do they know something about me that I don't? benbassify and benbassification: Although I am generally in favor of the benbassification of this country (and, indeed, world), all right-thinking people vehemently disagree with me. 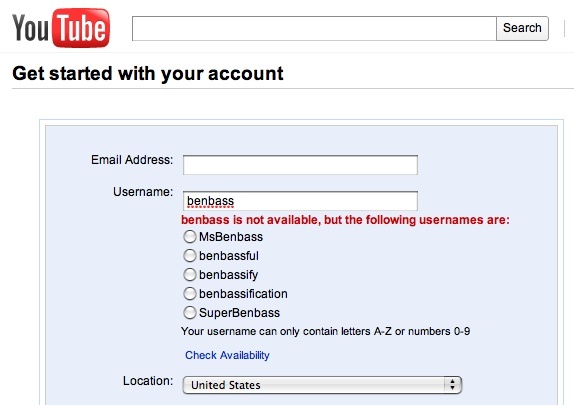 Again, who would go this route when choosing a YouTube username? SuperBenbass: Thanks for the compliment, but the shameless suckupery is off-putting, and even among people vain enough to name blogs after themselves, this seems obnoxious and preposterous to the extreme. Apparently, YouTube really is all about you. Hmm, there are some directions one shouldn't go, however. This was how I felt when I found out 'Mean Old Lady' was taken as a blogspot registration. Not in use, just reserved! So unfair.